Here is some more of that lovely block print and some more pomegranates. 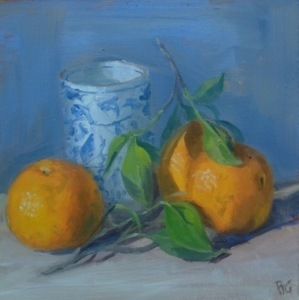 I dropped some more small paintings into Forge2 today (www.forge2.org.uk), a lovely gallery in Culworth, Northants. Well worth a trip, there are some wonderful paintings, prints and crafts there plus a great pub for lunch to boot. Home again, home again……….the drop in temperature was a bit of a shock! After a night under a warm duvet, I’m back to winter mode…almost. 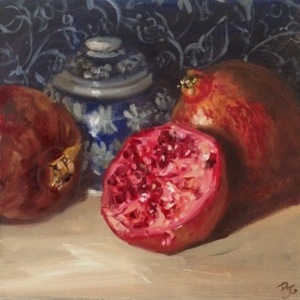 I had a couple of goes on these lovely pomegranates before I left. They are so sweet and crunchy, I hadn’t really appreciated how sweet they should be. Last one again now for a while until I get home and set up again. All this tooing and froing is playing havoc with my routine. I can’t wait to get home. This background is a block print I found in a local shop. 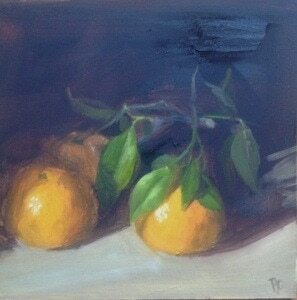 The clementines are still going strong….. The sun is shining here and the temperature is perfect – 24ish. Although I’m really looking forward to coming home to the UK next week, I know I will feel those icy winds. Still, I can’t wait to hit Waitrose! Well, I don’t know about you but I’m beginning to feel a lot like Christmas, even here in Pakistan with lots of notices of Christmas bazaars and balls at the different embassies. These clementines from the veggie shop with their leaves on reminded me of our Christmases in Israel. I have had a red-letter day today, my eldest popped the question to his beloved last night so I’m on the hunt for a hat! This painting was a bit wet when I took the photo. Hello from Pakistan! Well, I made it and haven’t turned back although I will be heading home in the next couple if weeks. It’s been a journey, in more than literal terms but I am feeling positive now that I’ve managed to source some turps – you have no idea what a mission that was! One of many. Anyway, I found these lovely fat aubergines in the veg shop which had a power cut (total darkness) whilst I was in there buying them! I will be home well in time to pop this in my suitcase and post out to anyone who might like it. I don’t want to bore you all to death with tales of my new life but some of you have expressed an interest. With that in mind, I thought I would do a separate newsletter so if you’d like to receive that, email me and I’ll out you in the list.